Big Dogs are NOT Right for Everyone: Are you a Good Fit? Considering adding a large breed or giant breed dog to your family and need a little help? Download your FREE Do’s and Don’ts Guide for Big Dog Owners today! When lying in your bed, big dogs take up more space than you do. In a nutshell, big dogs, when fully mature, will reach about 50 pounds or more and range in size from a Labrador retriever and German shepherd to the mighty Mastiff or Great Dane. But with big paws, comes big responsibilities when it comes to taking care of a large breed or giant breed dog. If you are considering opening your home and your heart to a big dog through purchase or adoption, please consider these 7 facts before you do. If you are considering purchasing a large breed puppy or giant breed puppy, plan to pay more… for everything. Big dogs cost more than small breed dogs. Period. They are more expensive to purchase, reaching well into the thousands of dollars for a well-bred large breed or giant breed puppy. I discuss this in more detail in Top 7 Questions To Ask A Dog Breeder When Buying A Puppy and The 7 Most Common Mastiff Myths Debunked. Beyond the cost of the large breed puppy, you should expect to pay more for quality, species appropriate food and veterinary care. Significantly more. People often mistakenly believe if they purchase a 55 pound bag of kibble dog food for $20, they can cut down on how much it costs to feed their big dogs. Yes, Dog Chow is cheap. And, yes, it is technically dog food. Well, hang on… let’s be precise… Dog Chow is a product some people feed their dogs. Ok, moving on. But this type of penny-pinching, frugal thinking is short-sighted. It may lead to lower out of pocket costs today, but at what expense to your big dog’s health tomorrow? Whether you are feeding a commercial dog food diet or a homemade raw food diet, you will want to budget in the cost of feeding a large breed or giant breed dog … BEFORE you buy! Secondly, the cost of veterinary care for big dogs will be significantly higher as compared to a small breed dog. From larger doses of preventative vaccines and pet medications to surgical expenses if required, be prepared to budget in healthcare expenses into the cost of owning a giant breed or large breed dog. And this list is just scratching the surface of possible costs related to big dogs and healthcare. For this reason, I highly recommend you consider investing in pet health insurance if you are serious about big dog ownership. I mentioned Embrace Pet Insurance in last weeks post about BLOAT, and it is the one pet insurance I recommend. 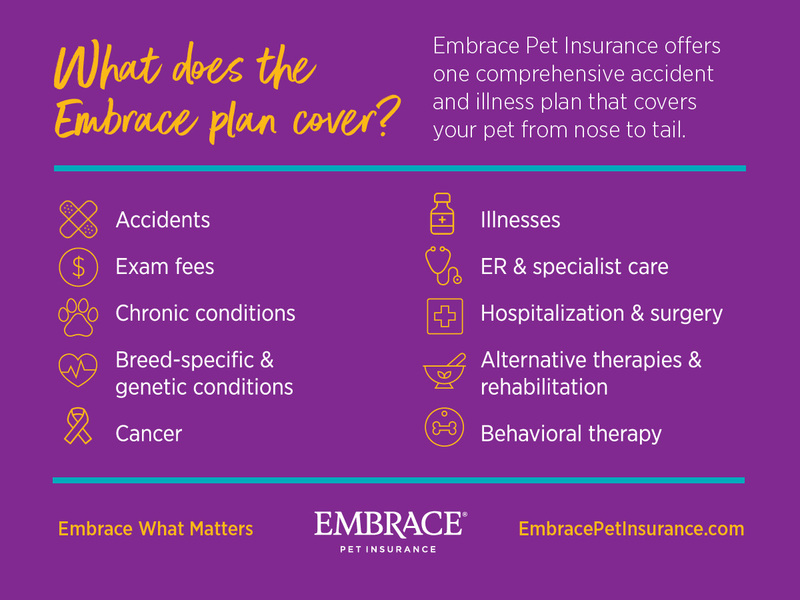 Embrace offers tailored plans to fit your needs including diminishing deductibles (reduces your annual cost each year), wellness rewards, fair evaluation of pre-existing conditions, and coverage for exam fees and much more. It was the only pet insurance that I was able to find that also covers gastropexy, a preventative surgery for GDV that you might want to consider if you are buying a large breed or giant breed dog. But whether you decide to purchase pet health insurance or not, these dogs are expensive to own. So, let’s make this a really simple decision. If you are going to need a payment plan in order to purchase your puppy, big dog ownership is not the best choice for you. Read The Ultimate Guide to Saving Money on Pet Medications for some great money saving tips and Buying a Puppy: The Gap Between Desire and Reason to ensure you stay grounded in your decision to get a large breed or giant breed puppy. Dog nutrition is something that most people look to dog food manufacturers for information on. Clearly, they are the experts, right? I discuss the topic of feeding giant breed puppies at great length in Feeding Giant Breed Puppies for Dummies – The Protein Myth & More, so I will cover just the high level facts here. Big dog breeds, especially giant breeds, grow faster and remain puppies longer than smaller breeds. This accelerated growth means that large breed puppies are extremely sensitive to nutrient and caloric imbalances, deficiencies, and excesses, all of which can adversely affect your puppy’s health. The goal with a large breed or giant breed puppy is to feed them a balanced, species appropriate diet which allows them to grow slowly and evenly. This can be accomplished by feeding commercial foods that are specially formulated for large breed puppy and large breed adult dogs, or, better yet, a balanced raw diet. These foods will generally be lower in fat, calories, calcium, phosphorus, and vitamin D. These nutrients in excess have been linked to a range of developmental orthopedic diseases such as Hypertrophic osteodystrophy (HOD), Panosteitis, and Osteochondrosis. Additionally, over feeding a growing large breed or giant breed puppy can lead to significant deleterious health consequences. Your large breed puppy’s growth should be a long distance marathon, not a sprint. There are no blue ribbons or special awards for the biggest or heaviest puppy. Think Tortoise and the Hare: slow and steady wins the race. 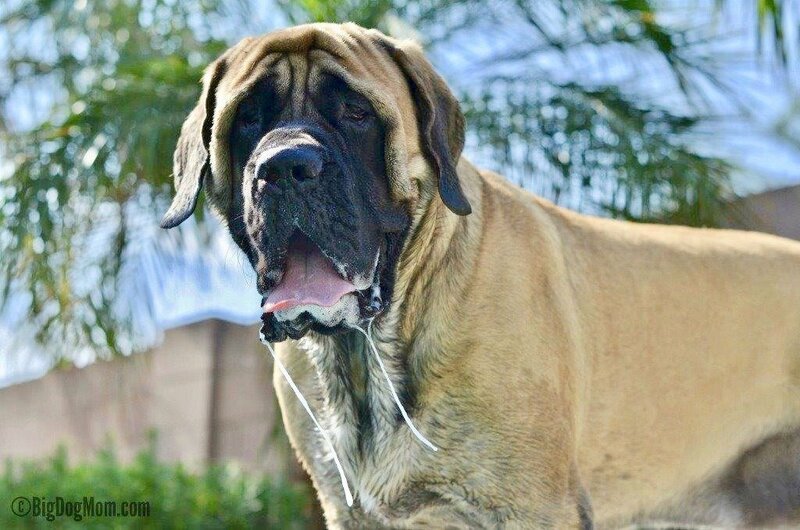 Lastly, proper feeding and dog nutrition can decrease the risk of bloat, or gastric dilatation and volvulus (GDV), which is common especially in deep-chested giant and large breeds like Great Danes and St. Bernards. Get all of the facts on bloat (GDV) in the Essential Guide to Bloat in Dogs: 7 Simple Steps That Can Save Your Dog’s Life. You don’t need a “Feeding Big Dogs For Dummies” book in order to provide a balanced, high-quality diet, I promise. But recognize the culinary decisions you make for your large breed puppy will directly affect his longevity, vigor and health in the future. For more on feeding giant breed puppies, read Feeding Giant Breed Puppies for Dummies – The Protein Myth & More. And you can grab your Quick Start Guide to Feeding Giant Breed Puppies here. A deceiving title for this section, but if I’ve got your attention, keep reading. If you are someone looking for a sign like this, you are NOT fit to be a big dog owner. Sometimes the truth hurts. But it is for your own good. The ONLY appropriate place from which to purchase a large breed or giant breed dog is through a reputable dog breeder. Or, if you are in a position and choose to, you can adopt a big dog from a reputable dog rescue. Not Craigslist. Not the newspaper, pet store, or a puppy broker online. We’ve discussed a few reasons already, but here are a few more reasons you will want to purchase your large breed or giant breed dogs through a reputable dog breeder. Big dog’s health requires special care and consideration. They disproportionately suffer from hip and elbow dysplasia, bloat and cancer as compared to smaller breed dogs. In fact, according to PetMD (nofollow), 8 of the 9 breeds with the highest incidence of cancer would be considered a large breed or giant breed dog. Wobbler Syndrome, Epilepsy, Arthritis, cardiomyopathy, hypothyroidism, and a variety of eye disorders are also conditions which can occur in big dogs. Reputable dog breeders perform health testing on the dogs they are breeding. The tests recommended will vary by breed, but nearly all breed clubs (see Resources page) have recommended tests that should be done prior to breeding in order to decrease incidence of disease in the breed. For more great information about health testing, read DNA Testing: Unlocking The Key To Your Dog’s Health and For The Betterment Of The Breed – An Interview With Jadem Mastiffs. How to Put an End to Dog Rescue: 10 Simple Solutions that CAN Work! 4. Are Big Dogs Apartment Dogs? It is a common misconception that many big dog breeds such as Mastiffs, St. Bernards, and Newfoundlands, are just big lazy dogs that lay around and do not require much exercise. This couldn’t’ be farther from the truth. Large breed dogs do not generally make good apartment dogs. Big dog breeds fall into the following groups within the American Kennel Club: Working Group, Sporting Group, Hound Group, and Herding Group. Bred for a specific job or purpose, most, if not all of these large breed and giant breed dogs, will become bored and destructive if not given adequate space, stimulation and exercise. While the required amounts of exercise will vary depending on the breed, very few of these breeds will be suitable or happy confined to a small apartment. How Much Exercise Does a Big Dog Need? If you are an ultra-marathoner looking for canine companionship for your long runs, a big dog is not right for you. Keep in mind that the larger the dog, the longer it takes for their growth plates to close. Because of this, big dog breeds are at substantially higher risk of injury as compared to smaller breeds. The following 3 tips should help as you consider how much to exercise your large breed puppy. 1. Only go so far as you are willing to carry your puppy home. Long walks (over a mile) are generally not a good idea until the large breed puppy is older or you are strong enough to carry him home when he gets tired. 2. Avoid puppy play on slippery floors. Not only does this increase the chance of injury, you are also putting unnecessary pressure on hip and elbow joints as they are developing. 3. Limit play time with other dogs. My rule of thumb is to limit playtime to about 15 minutes per month in age once a puppy is past 8 weeks. For example, when Junior was 12 weeks old, I would allow him a total of 45 minutes of playtime with Sulley for the day. I would separate this into 3 separate play sessions of 15 minutes each which I would limit further if the play got too rough. I made use of my play yard extensively during this stage to allow the dogs to be with one another but separated by the play yard fence. When Junior turned 4 months I increased the daily amount of play time with Sulley to 60 minutes, again broken into 3 or 4 sessions. WORRY-FREE SAFETY: Keep your pet contained and your home safe with the MyPet 8-Panel Petyard Passage. This enclosure features a lockable door made of strong, durable plastic and comes in an attractive espresso brown finish that fits flawlessly with any decor. SMALL LOCKABLE DOOR: This enclosure features a small swinging door, ideal to allow pets enter in and out of the area, but also locks to securely contain your furry friends. ENDLESSLY CONFIGURABLE: The 8-panel play yard is 26" tall and encloses up to 34.4 square feet of space. It can be made smaller by removing 2 panels at a time to create a smaller play area or a cozy crate for training or sleeping. EASY ON FLOORS: Thanks to the durable skid-resistant pads, this play yard will stay put and won't scratch or damage flooring. CONVENIENT & PORTABLE: With foldable panels and convenient carry strap, this lightweight yard is easy to move, perfect for travel, and can be used both indoors and outdoors. Proudly made in the USA. Don’t forget to grab you FREE Do’s and Don’ts Guide for Big Dog Owners which provides more detail on feeding, exercise and the other specific needs of big dogs. If you buy a big dog you will be faced with this not-so-pleasant reality. Let’s face it, living with big dogs is a messy business. Even the fastidiously clean Rhodesian ridgeback can’t compete with a Chihuahua. I’m sorry ridgeback friends. It’s true. And no matter how often you clean your house or bathe them, if you have a Newfoundland or a Mastiff, forget about it. You need to kiss your fantasies of a perfectly sanitized home goodbye. 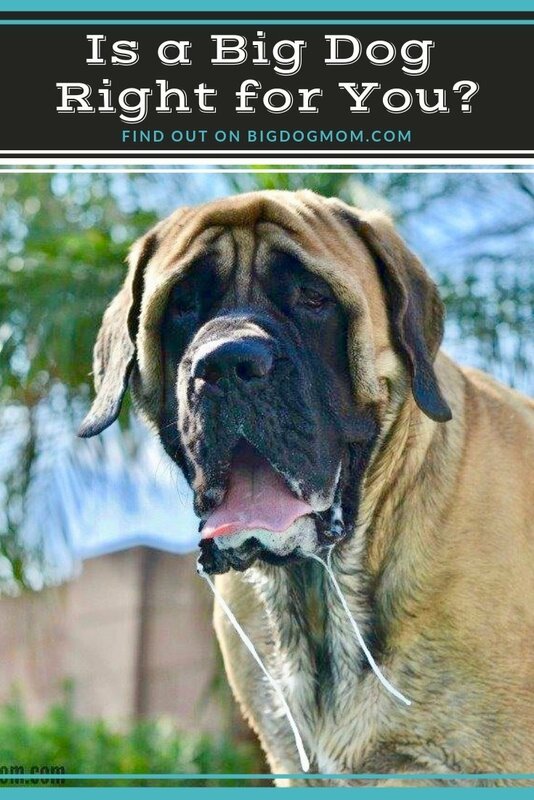 For a reality check on life with big dogs read Life Lessons: What I Learned from an iPad, Flip Flops, and Two Big Dogs and How To Make A Great First Impression Big Dog Mom Style. BEFORE you purchase any one of the big dog breeds, consider your desire for a clean home and clean clothes. How do you feel about dog hair on your clothes? Dog hair in your car? And let’s be real, dog hair in your food? What about dog hair and slobber on your walls, carpet, floors, and, (more reality) your kids? How do you feel about your personal property? Would you be willing to forgive damage to your favorite hat, your bedroom furniture, remote control, or eye glasses? I am not going to sugar coat this. If you are neat freak, you are NOT a good fit for a big dog! 6. Big Dogs Need Training. Lots of it! Whether you want to get involved in dog sports like nose work or conformation or not, trust me on this one. You do NOT want to be the person being dragged behind your big dog or to have a big dog that is not friendly toward other dogs or strangers. Obedience training is critical for ALL dogs, especially big ones. Positive training methods using treats, toys and fun as rewards work best. In addition, while socialization should start as soon as the puppy’s eyes and ears open at about 3 weeks of age, you will want to budget for group puppy training and puppy socialization classes as well. Bomb proof big dogs come with a cost. The total cost for both of these will run several thousand dollars at least. And if you are thinking you can save some money and train your big dog yourself, I’m sorry to break this to you aspiring amateur dog trainers out there. Formal dog training classes will give you the opportunity to expose your large breed puppy to new friendly people and other dogs and allow them to experience how wonderful the world around them is. Your home alone is no substitute if you are looking for a bomb proof big dog. The investment in positive training early in your big dog’s life will pay off in creating a well-mannered, and bomb-proof canine good citizen. Your puppy will love it and you will reap the rewards for years to come. For more on large breed puppy training, read 8 Foolproof Ways to Find a Great Dog Trainer for Your Big Dog and Puppy Fear Periods: The 5 Things that Can Save Your Puppy! 7. How Long do Big Dogs Live? Dog life expectancy, or the lifespan of dogs, varies widely among dog breeds. Because large and giant breed dogs age more rapidly than smaller breeds, they tend to have a shorter lifespan. This rapid aging causes their bodies to work harder to reach their normal adult size. Consider the difference between a Chihuahua and a Mastiff. A Chihuahua may only reach 6 pounds when full grown, while a male Mastiff can reach 200 pounds or more. That is a lot of growing which occurs in a relatively short period of time. As such, the average lifespan of a Mastiff is 8 years with only 25% or so reaching 10 years of age, while the average lifespan for a Chihuahua is 12-20 years. So, here is the heartbreaking truth. Big dogs never live long enough. While you are supremely blessed with each day of life, be prepared for the giant paw sized void that will be created in your heart when your big dog is gone. Look, big dogs are NOT right for everyone. My objective with this article is not to deter, it is to empower prospective puppy buyers to make a more informed decision on the size of dog breed they choose. Knowing whether you are the right fit for a big dog is one of the most important decisions you will make. And that decision should be made BEFORE you buy. If I can inhibit just one status seeker or impulse buyer from getting a big dog, then I consider this post a success. That said, if you have read these 7 facts and are still unwavering in your desire for a big dog, then go for it. Welcome to the Big Dog Mom Community! Take the following two steps and make it official! I am so happy you’ve joined us! Grab your Do’s and Don’ts Guide for Big Dog Owners. From healthcare to feeding to training, this guide will give you a high-level overview of what is in store for you as a big dog owner. Join the Big Dog Mom Community on Facebook. It’s FREE, it’s exclusive, and it’s a blast! Join hundreds of like-minded dog owners learning, sharing and supporting one another on this adventure called big dog ownership. Do you share your life and home with a big dog? Tell me in the comments one thing you struggle with or one thing you love about life with big dogs. Great post, such important information! Great article! I love big dogs. Owning three now (Giant Schnauzer, Spinone Italiano and an Irish Wolfhound); everything you wrote is 100% absolutely true! Thank you so much, Carla! I love them too. You are lucky though…very little drool or hair in your house. I have always loved Spinone’s and Wolfhounds! I must admit, this post definitely resonated with me. Many of the reasons you listed is exactly why I don’t have a dog, let alone a BIG DOG. Great points! Thank you, Kamira! You are right, dog’s, especially big dogs, are not for everyone. Every potential dog owner should read these points, to be aware of what they are taking on. A big dog is a whole different world, your points reminded me why I wanted smaller dogs. People really do underestimate big dogs and what it entails. I agree wholeheartedly, Michelle. Thank you! Such interesting facts about large breed puppies. I didn’t know how important it was to limit long walks due to their growth plates taking longer to mature. Through your articles, information, and adorable pictures, it’s so clear that you have BIG, BIG love for big dogs! Thanks for sharing! Small dogs fit more comfortably into our lifestyle but I think the lifespan is also one of the big drawbacks for big dogs. One of Mr. N’s dog friends is a giant breed and they’re the same age but his friend is fading pretty rapidly and his days are pretty limited at this point. It’s very sad. Aww, I’m so sorry. Yes, longevity is one of the biggest considerations people should weigh before buying a big dog. You can do everything right, buy from a reputable breeder that does and recommends health testing, feed the right food, provide the very best care, and still many large breeds are doing very well to live beyond 8 years. I especially like #3 (you have bigger issues – yup). #7 is something to consider but a shorter lifespan can, unfortunately be the case with Puppy mill rescues, too. We’re lucky to love them for as long as we can. Thanks for sharing these great points! I agree, Sadie. This would apply to many dogs, not just big ones. Thank you! Big dogs are certainly not for everyone. These are all good points. I personally love having a big dog, but when I injured my ribs I was unable to walk them because I wasn’t strong enough. My BIGGEST pet peeve of large dogs is the counter surfing. No matter how good I am at clearing the sink and counters, and wiping them down, inevitably the dogs are looking for scraps. I blame the kids for leaving food out. It’s a constant battle. We are city folks living in a condo, so yeah big dogs are not for us. Plus the lifespan thing does play a role. Our 20 lb mutt is going strong in his teens and we are so thankful for that! That’s wonderful, Paroma! Yes, a small condo is probably not the best choice for a big dog. Our big dogs have done really well with all kinds of small living spaces, including staying in a trailer for a few months. As long as they get their fun outside, all they need is enough room to lay down. I agree with you – as long as they get ample exercise outdoors. What an amazing and necessary post! You’re right, a big dog isn’t for everyone, and I really hope people who decide to bring one into their lives have thoroughly thought about all of the subjects you’ve mentioned. Not really thinking things through or being willing to seek appropriate resources are a main reason why dogs are surrendered, unfortunately. Thank you, Bryn! I couldn’t agree with you more. Wow! I don’t think I knew the lifespan of a big dog was so much shorter. That would be really hard! Yes, it is. I have been fairly lucky. My first mastiff lived to almost 10 when she was diagnosed with bone cancer. And our lab lived to almost 16. I am praying Sulley and Junior are here to stay for a very long time. Good post! All of your points are good, but I think it is really important to remember that big dogs cost more when it comes to medications and feeding, etc. And training and exercise are extra important the larger the dog becomes (but even a 5 pound dogs needs both). Thanks for bringing up so many good points. Thank you, Kate! The added expenses just can’t be minimized, especially when you are talking about a giant breed like a Mastiff, Irish Wolfhound or Newfie. My rule of thumb is to not own a dog that I cannot carry up the stairs. I owned one dog who became paralyzed for a year and when one leg was amputated, it made her 7 pounds less, which made her easier to carry. My next springer also had mobility issues at time and I needed to carry her too. I do not think I could ever cope with a big dog! They look magnificent but from a practical point of view – no. I had a very petite friend who had TWO Pyrenean Mountain Dogs. They were SO BIG she could only walk them one at a time. I know my limits, and my budget. I leave big dogs (and maybe cats too) to the experts! Comprehensive post, especially addressing the grim reality that more than likely, you’ll lose your big dog sooner than a smaller one. And I love how you framed the dog slobber, messiness factor around anti-bacterial gel. I’m not a fan of those gels, but I have friends who swear by them, so this make me chuckle. No big dogs in their future. Great tips as usual! Vino always incites excitement about large dog ownership, by it’s always fantasy really. While I love, love, LOVE my giants, it is different and I’d rather people knew that! The short lifespan was something I always pass on, and the vet care and feed is something no one thinks a about when they meet him for the first time! I will always have giants though, love the saggy faces too much not too! Oh, I couldn’t agree more, Shayla! Thank you! This post should be required reading for anyone who has ever thought, “Gee, I’d love to get a Mastiff/St. Bernard/any big dog breed. They are so cute!” Not knowing what to expect from a big dog but getting one anyway is a recipe for disaster. The heartache of having to give up a dog because you didn’t know what you were getting into can be devastating for both the owner and the dog. Your article keeps it real. Thank you so much, Lori! Many surrender cases are those that could have been avoided with proper due diligence. It is sad to me that people sometimes will buy a puppy with no more thought or research than a new pair of shoes.